Our female youth and adult ladies' sized varsity jackets were designed to provide a better fitting jacket for females. These are ideal for school and club teams, recreation groups, organizations, etc. NOTE: All Ladies Cut Jackets are considered custom orders. They are available in any combination of leather, imitation leather and wool colors with your choice of knit trim, lining, and collar. Approximate production time is 3-4 weeks. 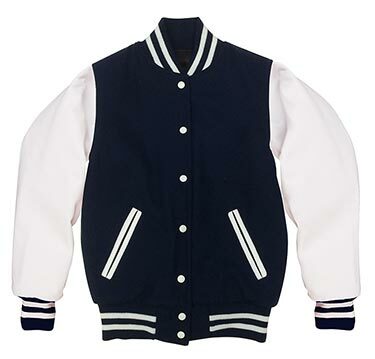 Please email info@lettermanjacketwarehouse.com for more information about our Ladies Cut Letterman Jackets or call toll-free 888-377-8989 to place your order. 1-11 pcs = $207.00 ea. 12-47 pcs = $197.00 ea. 48+ pcs = $187.00 ea.